This is a very visually exciting mascara from Givenchy which I had heard about a few times before but never actually given it a try. The masacra is designed to hold on to lashes at the root to give the lashes volume and body but separating and defining the lashes also, its unique spherical wand shape claims to be suitable for any eye shape and to reach all parts of the lashes. The small and round shape of the brush definitely does allow for more accurate application and to move around the eye with ease, but i'd say its most appealing benefit is that it certainly does deliver with defining the root of the lash with no need for another coat in order to do so. It immediately gives precise results and successfully seperates the lashes at the base so gives the lashes a 'panoramic' effect. It is not the most lengthening mascara I have used, but I think the depth and intensity it gives at the root makes up for it, particularly if you prefer a more defined and shaped look to a lengthened one. My only other set back is that it does take a while to dry, and did lose its shape slightly throughout the day but these are only small negatives to the product that easily can be rectified, in general I think this is a brilliant mascara. 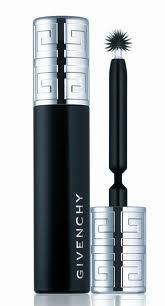 The packaging is also lovely, as with all Givenchy make-up products, with their signature 'G' branding around the top of the mascara. It is relatively small so travels well with its compact design. In terms of price, it is more of a high-end mascara (£20) but I think it merits investing in it and indeed there are some fantastic affordable mascaras out there but this one provides luxury, is innovative and has a different approach towards mascara application with successful results. Wow, I love the brush! The packaging is so lovely! Any chance we could see a couple of pics of the mascara on your lashes? I tried this a couple of years ago at a duty free shop aboard the ferry to France and remember loving it but for some reason decided not to purchase it. Would be great to investigate it again! I love this mascara so much, but I do find that it takes a bit longer to apply than other mascaras. However, it's completely worth it; I keep re-purchasing this! I've been enjoying your blog for a long time now and also I appreciate your awareness concerning the use of products that are not tested on animals and the looks that you both create are astonishing! I wanted to make a comment (and this has to do with Givenchy's mascara but not only with it because it's a general problem): I use to test the ingredients of my cosmetics via www.codecheck.info and they use to identify food and cosmetics in which palm oil is included. Because that is really a major problem (for further information see: www.palmoilaction.org.au/index.html). I had to realize that in nearly e-v-e-r-y single piece of my make up collection (not to mention the body care stuff) there is palm oil and that it is especially difficult to find decorative cosmetics without palm oil (I don't know if I'm allowed to mention the products here). I don't know if you are interested in the problem but if so and if you can recommend products sans palm oil it would be very nice if you would share your knowledge! I have tryed this mascara and I am not so excited. It gives me random lashes. The brush is scary haha, you can make accident very easy. I wonder if the drug store version is any good as well? The brush is definitely interesting! Sounds like a good product! Hmm. Givenchy is certainly not cruelty free. Don't know if you guys are still into that or not. Not trying to preach...just saying. I have been very curious about the brush. Thanks for the post! I've got this mascara, using it now, while I'm on maternity leave is fine, but I can't imagine brushing 3 lashes at a time while hurrying to work! It looks like something I could quite easily take my own eye out with! 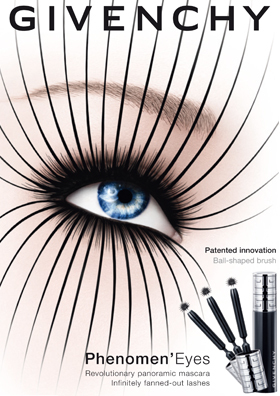 There is a copycat brush on a product called L'Oreal - Telescopic Explosion mascara. Could you do a comparison? I saw one documentary on http://www.usemeplz.com about creating such mascaras.. and now I know that it is very harmful for eyes.. and I try not to allow use it my girlfriend..
holy grail mascara for me. gives me doll-like lashes. The brush is just amazing, I've tried it before and found the weird brush got to the hard to reach outter corner lashes really easily. I have tried this mascara and I really loved it, my lashes looked fuller and longer. Even though as described by my friends the applicator looks like a torture device, I really liked it! This is my go to mascara. I use the "effet extension" type since it has an amazing lengthening effect and dries quite fast, I simply love it.